Well, AquaCera sent me a Pioneer SS4 water filter system gratis so I could give it a test run. They're not paying me anything for this review, and they didn't even ask me to write one. But I want to pass on this information to help out anyone who is looking for a gravity filter and/or considering buying an AquaCera. We'll take a look the features, as well as how effective it is in removing contaminants from drinking water. And I'll discuss how it compares to the Berkey water filter, which I also own. You'll find a video, too, of me unboxing the AquaCera, assembling it, and using it for the first time. If you'd like to do a quick check of the price at Amazon, click here. Use this quick navigation to skip to the parts that interest you the most. Or just keep scrolling to read the whole review. All countertop gravity water filters work in the same way. There are two containers, stacked on top of each other. The top one holds the filter elements. You fill it up with unfiltered water, and gravity pulls the water down through the filters and into the bottom container. A spigot in the bottom part allows you to dispense the purified water. You'll be glad to know that this water filter is not at all complicated. Here are the main things you need to know about it. The two containers and lid are made of grade 304 stainless steel. That makes the AquaCera lightweight, durable, and resistant to corrosion - pretty important for something that's constantly in contact with water. It's also easy to transport, so you can easily take it with you when you travel. Note that the capacity includes both the unfiltered and filtered water. So, with the Pioneer, you can have about 2 gallons of filtered water in the bottom, ready to drink. Of course, as the water level goes down in the bottom, you can keep refilling the top so that you have a constant supply. 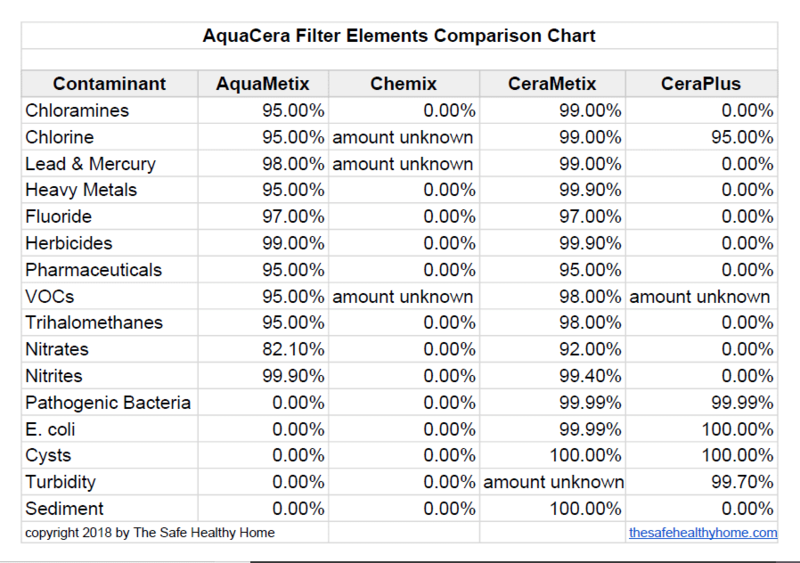 If there's anything at all complicated about Aquacera, it's in the filter element options. Let me break it down for you. When you buy a system, you'll order it with either 2 or 4 of the same filter type. The advantage of buying 4 is that the water will filter through faster. These are block filters that don't need to be primed. You can use them right out of the box. 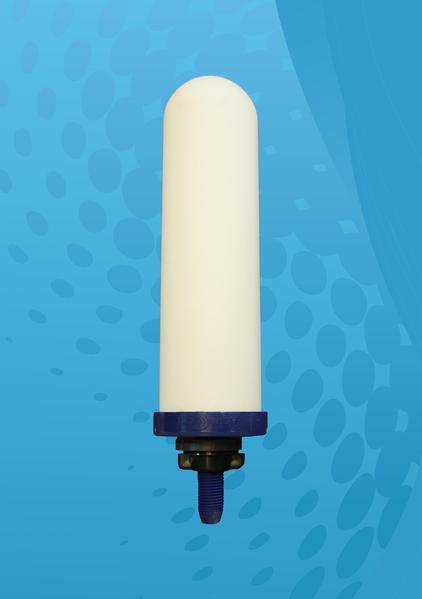 They are designed only for municipal water supplies because they do not reduce biological contaminants. AquaMetix reduces VOCs, heavy metals, lead, pesticides, herbicides, pharmaceuticals, chlorine, chloramine, fluoride, nitrates, nitrites, and more. Chemix looks like the AquaMetix, except it's red instead of blue. It reduces chlorine, lead, mercury, and VOCs. These filters have a core encased by a silver impregnated ceramic shell. The shell reduces biological contaminants like bacteria and cysts. Inside the ceramic shell of the CeraMetix is an AquaMetix core. That means it can reduce all the same chemicals that the AquaMetix Quick Drip does, plus biologicals such as bacteria and cysts. This is the one to choose if you want a survival type filter. CeraPlus has a coconut shell granulated activated carbon core with the same ceramic shell. It reduces bacteria, cysts, some organic chemicals and chlorine, but not much else. AquaCera systems are super easy to put together in just minutes. You can watch me do it in this video. Something I like about the AquaCera filters is that they don't need to be primed before you use them. Just put them in, add water to the top container, and the water starts flowing through immediately. Since the four filter elements are all different, I thought it would be easiest to make a chart comparing how much they reduce a variety of contaminants. The numbers come from spec sheets and lab test results. Unfortunately, they're not all specific. If the spec sheet claims that it reduces a contaminant, but doesn't give the amount, you'll see "amount unknown" in the chart. If the spec sheet doesn't say anything about a particular contaminant, the chart shows "0%". It's possible that the filter does reduce that contaminant, but there's no way of knowing for sure from the published information. You might have noticed the absence of minerals in this chart. None of the AquaCera filters remove beneficial minerals from your drinking water. The manufacturer recommends replacing all four kinds of filters after 12 months of use. You can check availability at Amazon by clicking here. I want to point out that the two Quick Drip filters have varying capacities for certain contaminants. For example, the Chemix filter is rated to 2500 gallons for chlorine, but only to 450 gallons for lead, mercury, and VOCs. And the AquaMetix reduces lead for up to 750 gallons and chloramines up to 1150 gallons. There are also different sizes of the CeraMetix and CeraPlus, and that affects the capacity as well. CeraMetix comes in two diameters: Slimline and Imperial. The Imperial is larger, giving it a longer life and faster flow rate than the Slimline. They're almost the same price, so I'd go for the Imperial if I were buying CeraMetix filters. Click here to check the price of the AquaCera Pioneer SS with four CeraMetix Imperial 7" filters at Amazon. You'll just need a screwdriver to attach the knob to the lid. There's a one year manufacturer warranty on the housing and the filter elements, no matter which version you buy. You may be familiar with Berkey gravity filters. They're very popular, and they're similar to the AquaCera filters. Because I've used both, I can give you a little insight into how they're alike and how they're different. 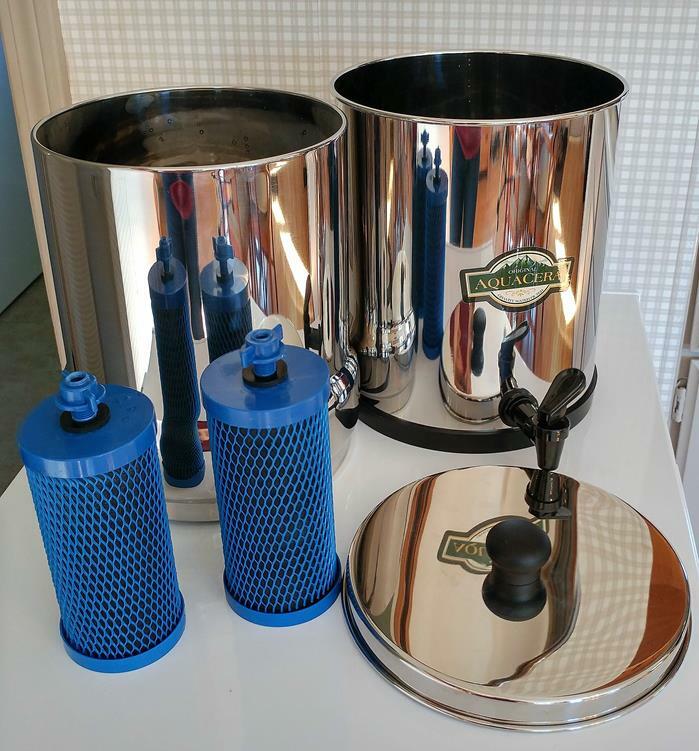 The AquaCera Pioneer SS4 and Big Berkey models are similar in size - both hold about 2 gallons of filtered water in the bottom container - so we'll compare those two. Both have containers made of stainless steel. Both come with a plastic spigot. Berkey has two other spigot options: a stainless steel spigot and sight glass spigot. AquaCera does not have these, although you could probably use the Berkey ones in it. Both come with non-skid rubber rings for the bottom of the unit. Aquacera comes in two sizes. Berkey comes in six sizes. Three of those sizes are larger than the Big Berkey and AquaCera Pioneer. Although Berkey does have a ceramic filter available, the Black Berkey filter element is far more popular because it reduces a wider array of contaminants. Of the four AquaCera filters, the CeraMetix comes the closest to the Black Berkey filter in terms of contaminant reduction. CeraMetix and Black Berkey are almost equal in the reduction of the contaminants that most people would be concerned about - chlorine, chloramine, lead, VOCs, bacteria, and others. When it comes to fluoride, Berkey has a slight edge over AquaCera - 99% to 97%. CeraMetix is an all-in-one filter; Berkey requires an additional fluoride filter. Berkey filter elements cost more, but they last much longer than the AquaCera filters - three to five years (Berkey) versus one year (AquaCera). Black Berkey filters and fluoride filters have to be primed before you can use them. AquaCera filters don't require priming. By the way, the AquaCera and Berkey filter elements are interchangeable, along with other similar systems like Propur and Alexapure. Just make sure you have the right height filter to fit in the container. 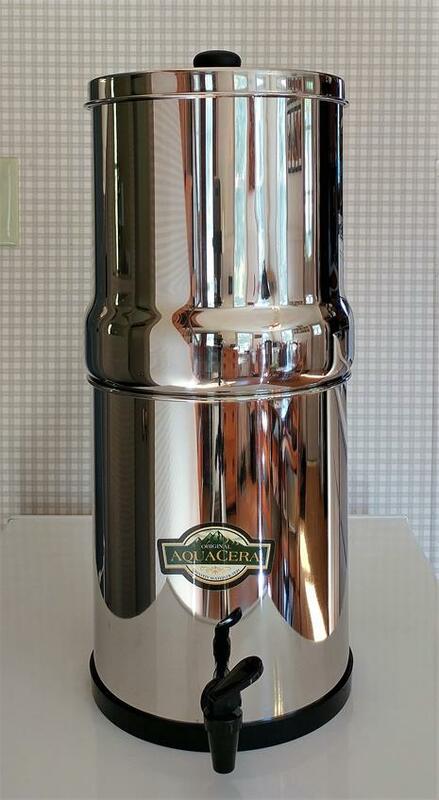 If you're looking a portable stainless steel gravity water filter, the AquaCera is definitely worth considering. Although it's not as well known as the Berkey, AquaCera can hold its own in a side by side comparison. That is, if you use the CeraMetix filter elements with it. The Pioneer SS4 is the right size for a small household of one to four people. If you have a large family, you'll want to go with another brand like Berkey that makes larger systems. 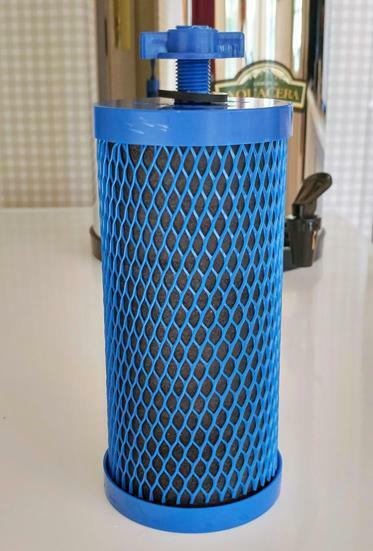 If you're on city water and don't need a filter for survival or emergency situations, then the AquaMetix filters would be sufficient. The cost is significantly less than Berkey and somewhat less than the CeraMetix filters. The system with four AquaMetix filters is available from the manufacturer, Aquacera. To check the current price and availability of the AquaCera Pioneer SS4 with two Slimline CeraMetix filters at Amazon, click here. And for the Pioneer with four Imperial CeraMetix filters, click here.